Are you looking for a healthy snack or a light lunchbox dessert? Energy balls are all the rage right now; and they’re perfect for a snack to keep children (or adults!) going until the next meal. Many of the popular recipes are crammed full of nuts which aren’t always welcome in schools - so check out this simple nut free option. Follow a recipe; follow food safety & hygiene rules; tidy away; use measuring spoons and cups; use balance/digital scales. Blender, Weighing Scales, Measuring Spoons, Chopping Board. Blend half of the pumpkin seeds in a blender to dust like consistency and put aside. Put the remainder of the pumpkin seeds in the blender, with the puffed rice and dates, and blend. Add the remaining ingredients and blend until sticky. With wet hands take small amounts of the mixture and mould into 10 balls. Roll the balls in the ground pumpkin seeds. Place in a suitable container and leave to set in the fridge. These will keep for around 2 weeks if stored appropriately in the fridge. 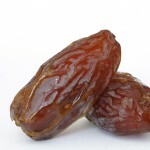 Dates are a type of fruit. With around 60 per cent of their weight coming from sugar they are one of the sweetest and stickiest fruits around! They are a good source of iron and B vitamins and are high in fibre. 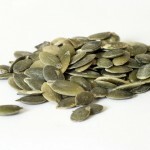 Pumpkin Seeds are a fabulous source of protein and iron. They are also high in unsaturated vegetable oils and an excellent source of vitamin E and zinc - wow!! Oh and they also provide fibre!